Kevin Miller is the Director of Marketing at Spire, a wearable technology for tracking stress and activity by monitoring the breath of the user. Launched in 2012 from San Francisco, Spire has picked up investments from Y Combinator and other VC firms and has garnered the attention of the Wall Street Journal, Business Insider, and other mainstream media publications. 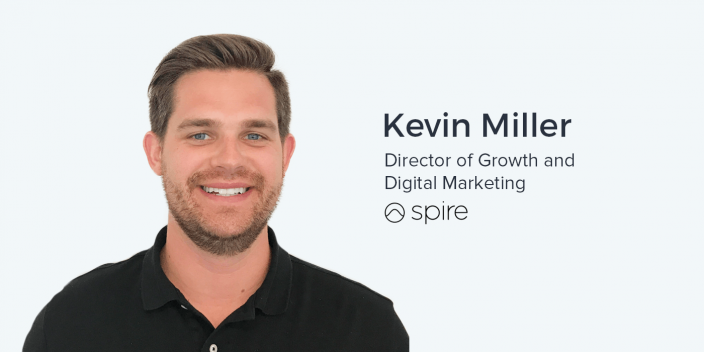 Prior to Spire, Kevin served on the Google Sales team and as a growth marketing consultant for a number of high-growth startups. The wearable and Internet of Things industries present a unique set of challenges, especially when compared to digital products, whether they are consumer subscriptions services or B2B SaaS tools. “I think a lot of people are thinking about making it a fashion statement or how easy is it to wear. When we talk about that retention issue, a lot of people forget it and go a couple of days without it and they don’t notice a huge drop-off in whatever they were expecting to get out of the product, and then they just don’t wear it again. In addition to the challenges encountered by most, if not all, eCommerce such as retail and physical product placement, wearables must also be stylish and feature comfort as a key value proposition. With intent based, keyword targeting, AdWords is a tremendous driver of acquisition across all industries, especially for target customers actively in search of a specific solution. The solution is to target ads based on informational and education focused keywords related to the problems that the product helps them solve. It’s no secret that many people are annoyed, frightened, or otherwise bothered by privacy issues raised by digital advertising. Much of this might be the result of inaccurate or incorrect targeting, as well as poor messaging by the marketers running the ad campaigns. As advertising technology improves and personalization increases, advertising will likely become less intrusive and ideally more welcomed by digital audiences. Ander: This podcast is actually, in many ways, a good excuse for me to reconnect with some people who I haven’t seen in quite a while, and that includes the Head of Marketing at Spire, Kevin Miller. Kevin, how are you doing? Kevin: I’m doing great. Thanks for having me. Ander: Yeah. Thank you so much for coming into our office. Obviously we want to talk about what Spire is doing in terms of advertising. We want to talk about what the wearable world is looking like right now in Silicon Valley and beyond. But first, let’s hear about what Spire actually is. What is this little device that I’m wearing on my hip right now? Perhaps our audiences has seen it on Amazon, or in Apple retail stores, or elsewhere. Kevin: Yeah, absolutely. The Spire device is a wearable technology that you use to help manage stress in a healthy way. You wear it just much in the same way as you would wear the first iteration of the Fitbit – it’s either clipped on your belt or on the center of your bra – and it helps to track your breathing patterns and your physical activity. Based on how you’re breathing, the device is able to identify when you’re stressed, tensed, focused, and calm. And if you experience a few moments of tension, we’re going to be able to actually give you real-time notifications that help you return to a state of calm. It could be a breathing exercise or it could be a meditation. The whole value of Spire is in this real-time notifications, helping you avoid these panic attacks and things of that nature. Ander: Really, really cool. I remember when this thing came on the market… it wasn’t even too long ago. Sometime in the last couple of years, more or less? Ander: I remember, thinking that’s going to be something really, really cool someday. I bet there’s a lot of people using it. What can you tell us about how it’s grown in that period of time? Kevin: Absolutely. It was a very intensive development process because it’s an extremely sophisticated tech to be able to accurately be able to read your breath rate, HRV, and other things like that, and have that be indicative of your state of mind. It’s extremely complex compared to just step-tracking and things of that nature. We’ve got an incredible tech team that works on that. Ander: Interesting. When you say it’s a ‘need to have,’ what are some of the qualitative differences between a ‘need to have’ and a ‘nice to have,’ in a little more detail? Ander: Wow. That’s a bold statement. Kevin: Yeah. It’s incredible. People just don’t want to deal with those side-effects. They want a holistic and natural way to mitigate stress and anxiety and they want to feel better physically. They’ve studied the science and they realize that if you learn how to control your breathing and you practice these mindful exercises and things of that nature, it has a profound effect on how you feel physically and mentally. Let’s hear about how you got to Spire. You were previously at Google What kind of brought you there? Kevin: The Google experience was incredible. I was there for two years working on the AdWords team, with big clients with search / display – YouTube, you name it. And, at Google they are very good at instilling this idea of being extremely detail-oriented when you look at analyzing ads and thinking about how to relate to the customer, really being in their shoes. Operating that way for so long, it gave me a good foundation into what it takes to be a good marketer and understand how to relate to your audience. But in that experience, I realized that I didn’t want to just be silo-ed into one paid channel and I found it more exciting to be at a smaller company where I could be paving the way for that growth. I made the switch to Spire because the growth opportunity for me and the personal development opportunity was unmatched. I was able to come in and, do paid advertising but also establish our channel on Amazon, help promote us in the Apple stores, work on email marketing, and have free reign to experiment with a number of other channels. It’s been a pretty rewarding experience thus far. Ander: When you came into Spire, did you have any sort of specific philosophy about digital advertising, about paid acquisition? Did Google formulate that? And how has that actually changed since you’ve been making this wearable something that people are talking about? Kevin: Yeah. At a high level, my philosophy at it relates to digital marketing and advertising is just I am a firm believer in delivering the right message to the right person at the right time. It’s very simple when you think about it in those terms. People, I think, in the future will begin to welcome advertisements if they follow that cadence. Ander: And if they’re personalized. Kevin: And if they’re personalized, of course. At Spire we’re very detailed and systematic in our approach about what message reaches what audience. For example, we’re working very hard on creating very substantive blog content. When I’m looking to capture an email on our blog, I don’t just say, ‘Hey, give us your email address.’ We say, you know, ‘Why did you visit our blog today? Is it because you want to be more mindful? Do you want to reduce stress, do you want to reduce anxiety? Or if it’s something else, let us know.’ Based on their answer, I’ll give them content via email that directly matches what they came to the blog for. Ander: So, you guys are segmenting your email content by the type of persona or by the needs of that specific segment. Kevin: Exactly. And then when it comes to advertising we use your behavior on the website. We’re extremely dialed in to understand: did you come to our webpage and bounce off the home page? Did you visit two pages, three pages? Did you add to cart? Did you reach check-out? Based on every single step in the funnel, we have a different message for you. Ander: And are you guys also customizing that message based upon the use case? Maybe somebody has panic attacks, maybe somebody is just looking to control their breathing. Do you guys do that level of personalization as well? Kevin: Absolutely. I think that’s our major differentiator. We’re speaking their language when we’re able to drill in and understand what their real need is for the product. That’s what I talk about when we look at the Amazon reviews and we look at analyzing emails that come in through customer support. I think the one thing that we do better than any other company I’ve ever been at is listen to our customers and understand what is it about our product that makes it indispensable to them. We zero in and focus on that thing and we replicate that in all of our marketing materials, whether it be the direct response ads you get or something you might see on the blog or authentic user stories that you would see and understanding how people get the most value out of Spire. Ander: And, presumably you’re working with AdWords at Spire as part of your acquisition strategy. Ander: What are some of the unique observations that you’ve made as it relates to the Spire product, the wearable space as a whole, and those in conjunction with AdWords? Kevin: Yeah, so when it comes to AdWords we actually have had some difficulty on that platform because the search volume is just not there yet. Kevin: Mindfulness is becoming a bigger space but if you’re looking to search for a mindfulness tracker or breath tracker, it just doesn’t exist. With fitness tracker and activity tracker, obviously that space is huge with the likes of Fitbit, Jawbone, Apple Watch, etc. Ander: What is the search volume for that kind of stuff out of curiosity? Kevin: It’s somewhere in the neighborhood of 4000 searches a month for breath tracker but for a fitness and activity we’re talking 500K to a million. Ander: Gotcha. Ok. I wasn’t sure if it was in like the 10K – 50K range or something like a million. Kevin: Right. So, you know, the way we get around that is by focusing on keywords that have to do with stress management or, you know, we obviously compete with terms when our competitors are bidding on us. But, we heavily utilize Facebook to be able to get in front of the right audience and allow them to discover Spire. And then, we have a pretty detailed customer journey based on the channel that you enter in. You’ll get specific messages that mirror where you came from. Ander: Is there anything since you’ve been with Spire that has surprised you? Anything that you’ve done, perhaps some tests you’ve run where you’ve seen results that you didn’t necessarily expect? Kevin: I don’t know if ‘underestimate’ is the right word but I am now fully aware of the power of Amazon. Ander: Let’s talk about that a little bit because that’s a huge thing for ecommerce companies. Kevin: Yeah. I did a bunch of research upon joining Spire and have talked with several marketers who have heavily utilized Amazon. For example Fitbit, I think, on their IPO. day, 37% of their revenue was attributed to taking place on the Amazon platform. Obviously that caught my eye. I also looked at products like Tile and saw how much they grew with their partnership with Amazon. I see it being beneficial in a number of ways. One, we get incredible distribution because there are so many eyeballs on Amazon in general. Being able to work closer with our vendor management team and understanding how to rank for certain keywords has an obvious art to that. Ander: Within the Amazon platform? Kevin: Within the Amazon platform. Oh yeah. Absolutely. When it comes to the details that you see on our product page, it’s an absolute science in terms of understanding how to describe the product and what keywords to use and things of that nature and making sure that you have the highest volume of keywords represented in your details. Things like making sure that your product is listed in the right categories and understanding which categories have the most organic visibility can help you a lot with sales. The other part of Amazon that I think is so valuable is the authentic customer reviews. I think that that is a major, major driver for sales for us because people can see it with a verified purchase tag. Amazon, as you know, has had a bunch of issue with the authentic of their reviews but they’ve cracked down significantly on that. Now when you come to our page, you see that what someone wrote about Spire un-incentivized. It’s very powerful when you get to see the effect that it’s making. It actually helps us with our employee recruitment as well. One of our most recent hires came in and said he chose Spire over another company because of the strength of the reviews. Ander: Really cool! And one thing that, off the top of my head, I am anticipating might be an interesting challenge with Amazon is that you have access to the innards of Amazon’s data, you know? And because you don’t have that level of access, you can’t see the bounce rate on your product page. You can’t see what might the holes be in the conversion funnel here, or whatever it might be. How do you address that? Kevin: Yeah, it’s a great question. Huge pain point and point of frustration for me as well! One trick we use is Amazon Associates. A lot of people don’t know you can actually be your own affiliate, and so we use a tracking link for that. I can see, based on different channels where I’m driving traffic to our Amazon detail page, I can see the conversion rate by channel. Kevin: We work very closely with Amazon. We just started doing some retargeting with them. You have to be doing a certain volume of sales to be eligible to get into this type of program, but now they actually placed a pixel on our website and on our A+ detail page. Now we can retarget people who come there which is extremely valuable inventory for me because otherwise we wouldn’t be able to reach those customers. different conversion rates and very different reasons for driving traffic to your site and, perhaps, the product page on your site and encouraging people to get into the cart and into the checkout flow, versus doing that with Amazon. I can make arguments for doing both. But, how do you decide which one you’re going to do with which piece of paid media or whatever it is? Kevin: Far and away our number one priority is to get people on our website because we’ve done a ton of testing there and we do our best job of educating the consumer there. Then, when they go and they review their buying options, we show that we’re available in the Apple store and we show that we are available on Amazon. Those are just secondary and tertiary options. The largest call-to-action that you’ll see is buying on our website. But we do make it clear that we’re also available at Amazon because people like to get their products in one day or two days if they’re prime customers. One thing that I found that I was surprised by is if you could cater to the customer in terms of their preferable form of payment, it can dramatically increase conversion rate. When I got there we were built on a custom CMS and now we are built on Shopify. By virtue of that, I can add PayPal as an option and I can add Amazon Pay as an option. On mobile we can use Apple Pay. It’s been incredibly impactful with regards to conversion rate on desktop and mobile. Ander: Shopify is a really cool platform and actually it works with Instapage as well. I get some questions about that kind of stuff during my webinars. What about Apple retail stores? I can walk into an Apple retail store, see that product on the shelf, pick it up, and walk out with it that day. How has that changed the way that you look at getting Spire out there and breaking through the noise? Ander: Interesting. That’s almost like a form of social proof, that you’re in the Apple store and listed on Amazon. Kevin: Absolutely. And I take every opportunity to use that when I’m talking to friends and family, pitching Spire to people, but also in the ads. You know, I’ll use Amazon reviews, I’ll use the logos of Apple and Amazon. And we work very closely with both partners to try to nurture that relationship to the best of our ability. And, yeah, it’s been incredibly helpful for me, thus far, in terms of moving units through those channels. Ander: What about the wearable space as a whole? Some people would argue that wearables are going to be the next big thing. Our shoes could be passing data through our mobile devices to the Cloud or Spire could be passing data to wherever it needs to go. What does the wearable space look like to you? Where do you think that’s going? Kevin: With regards to wearables, I think the age old problem since the rise of Fitbit and Jawbone and other players has been retention. Ander: That makes perfect sense. It’s a one-time purchase. Kevin: You make that initial sale and if you’re a one-product company like we are today, it’s incredibly costly if you can’t retain those people. We’ve got an incredible Head of Product and other members in our customer service team that take it very, very seriously to get the customer feedback and listen to understand if there’s a pain point or a bug or something like that. How big of a problem is it? And how quickly can we fix it? Ander: Are you defining ‘retention’ in that case by the type of engagement they have with you guys afterwards or by the number…? Kevin: Both in that engagement but you also how long they use the product after they buy it. Is it 30, 60, 90 days? Or six months? Or a year? We measure all of those things very closely. If they churn, what was the problem and how can we fix it? We try to uncover the part of the app and product that’s indispensable to the consumer. We don’t want to tell you just how many steps you took or how many times you got tense throughout the day because that doesn’t help you. We try to provide you with actionable things to do as a result of those things occurring. If I’m getting super stressed out at a meeting with my manager, I can review my day and say, ‘Ok, it happened here, we were talking about this subject matter and it was at this time. Spire suggests that I do this meditation. And after the meditation, I got these results and here’s how I felt immediately after.’ That’s where I think we separate ourselves. We’ve kind of bounced the idea around about incorporating sleep into the app. What we see with Jawbone historically was I remember using the Jawbone UP and it would tell me, ‘Hey, you had a 78% quality of sleep last night. You woke up several times.’ That’s all it would tell me. That had a negative mental effect for me because I went into the day knowing I was going to be tired. Ander: It kind of sets you up for failure. Kevin: Right. The idea of a Spire would be, ‘Ok, we’re going to track your sleep but if you didn’t sleep well, we’re going to give you recommendations during the day that are going to help you to sleep better the next night. Ander: That’s an interesting idea. Kevin: The real essence in value of Spire is in those real-time notifications, helping you continually make improvements throughout your day and see yourself personally develop. Ander: As far as the marketing challenges that are associated with wearables, obviously you need to be creating that ‘need to have’ mentality about how the consumer is viewing the product. How do you do that? It’s something that you actually have attached to your body. How do you think that that affects how you and all of the other wearable marketers out there are approaching getting these products known to a big audience of consumers? Kevin: I think a lot of people are thinking about making it a fashion statement or how easy is it to wear. When we talk about that retention issue, a lot of people forget it and go a couple of days without it and they don’t notice a huge drop-off in whatever they were expecting to get out of the product, and then they just don’t wear it again. When we think about the future, we think about form factor and we think about what is something that’s extremely easy to wear that you don’t need to think about, that you don’t need to charge every day, and that is sleek and just not cumbersome for you to be thinking about. We want to have a form factor and think about ways to have you wear the Spire device and focus only on the value that it’s going to bring you. We think about that a lot and how that might affect how we market to customers in the future. Ander: On a broader level, with marketing and advertising in general, where do you see this space going? How do you see personalization becoming a bigger deal? What do you think the space is going to look like in a few years? Kevin: Yeah, so I you know, a lot of my friends use ad blockers. Haha. Kevin: As do I, ironically. Ander: Well, some of those ad blockers are created by Google. Kevin: Exactly. I think in the future, ads will be so personalized and so relevant to you that people will no longer hate them. People will no longer skip through ads on YouTube and things like that. Amazon, for example, does an incredible job of this. To view a product on Amazon and immediately get that on all of the different media channels that you use, reminding you to use it, giving you a discount, things of that nature. Even being able to predict based on your calendar integration. You’ve got a trip coming and it is able to predict supplies or clothing you might need for that trip. I think that’s the way marketing and digital advertising is going to go. A lot of marketers today still make mistakes where you’ll buy a product and you’ll still see an ad asking you to buy it afterwards. Easy things like having a dynamic list where those people fall off and you start sending them messages about how to be successful with your product. Making sure that you’re meticulous about those types of details, I think, is extremely important in terms of having a great customer experience and company image in general. I think advertising will continue to do that. I also think a major component of digital advertising is just able to continue to tell your story in a compelling and meaningful way and I think a lot of good marketers are improving in that area as well. Ander: A lot of people think this is “Big Brother” territory but I actually think it’s ok if it’s done appropriately and responsibly. Do you think it’s possible that some of this breathing, anxiety, wellness, mindfulness data could actually be used to target ads in the future? Not necessarily for Spire, but perhaps for anything that you’re wearing that’s passing data to the Cloud. Do you think that people might even opt in to having that data available to advertisers to get the most customized solutions for them? Kevin: I think with this specific class of people, it’s a bit more touchy because it’s a real need. People are often sold products that have a great promise but don’t actually deliver that solution. At Spire, we are laser focused on making sure that we actually solve your problem. I think people will begin to start opting into that more and more. I think as every day goes by, people are starting to use more apps and getting more familiar with seeing those types of ads and, like I said, as long as the app is personalized to you, delivered in the right way, not overbearing… If those conditions are met, I feel like people are going to continue to give more data and advertisers and marketers will get better and better at delivering the right message. Ander: Awesome. Kevin, this has been a really cool conversation. I personally learned a lot and those are my favorite interviews to do for this podcast. Before we wrap up, I want to ask you two questions – first, how can people check out Spire? Where can they get one? Obviously Amazon is one of those places. Kevin: Our website – spire.io – is where you can find it, as well as virtually every Apple retail store in the U.S. and abroad and Amazon. Ander: The other thing I’d like to ask you is what can we as the growth marketing community do to make marketing better as a whole? Obviously marketing is changing so quickly with all these new technologies coming out, new methodologies, and new ways for thinking about things. Wearables is just one example of a different mentality that you need to have around growth. How as marketers can we be prepared for that? What’s something that we can do to help other marketers prepare for that? Kevin: Yeah, that’s a great question. In the engineering community for years there have been open-sourced platforms and engineers working on certain things can pass code back and forth and save a lot of other engineers a lot of time and effort. Kevin: Being able to have access to that type of content for free is incredibly helpful to a number of marketers. I know it’s helped me learn as well, as well as having great mentors along the way. I think if we can follow the model that many engineers have started, growth marketing will be in a good place and these skills will continue to develop at a high rate. Ander: Awesome. Well Kevin, once again, thank you so much for coming to our office. Kevin: Thanks for having me. This has been great. Ander: I love my Spire! I wear it all the time. Haha. Ander: Yeah, once again, thanks for taking the time out of your day and I am sure we will talk to you soon.